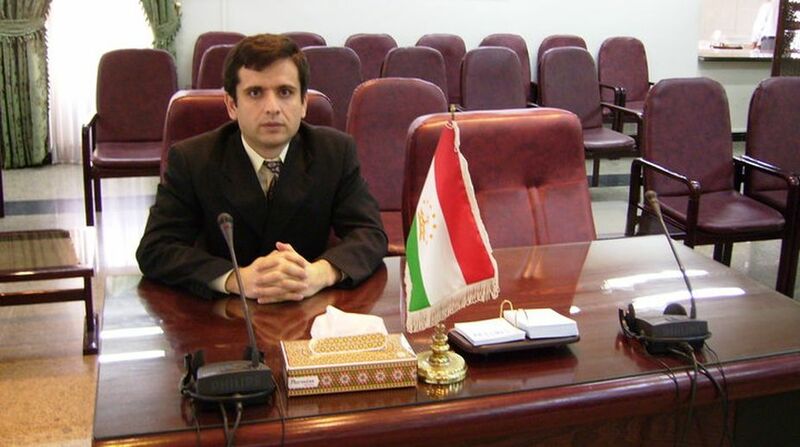 Mirzosharif Jalolov is fluent in five languages ~ Tajik, Russian, English, Chinese, and Japanese. He studied for his Bachelor of Arts in Mandarin language at the Beijing Language and Culture University. He then studied management and public police at Japan's University of Tsukuba. He is now Ambassador Extraordinary and Plenipotentiary of the Republic of Tajikistan to both India and Nepal. Starting his career in 1999,he served in the Ministry of Foreign Affairs of the government of Tajikistan looking after Asia and Africa. Jalolov was also posted in the Secretariat of Shanghai Cooperation Organisation and Secretariat of Economic Cooperation Organisation, Tehran. Before appointment as Ambassador to India he was Deputy Secretary General of Shanghai Cooperation Organisation, Beijing. How do you look at the current state of relations between India and Tajikistan? Tajikistan and India share good relations at all levels. In December 2016, our President visited India on the invitation of Prime Minister Narendra Modi, who himself visited our country in July 2015. There is a lot of undiscovered potential and opportunities waiting to be tapped. Is there any proposal to expand the defence cooperation between the two countries? Our defence relations see a long history, with mutual concerns being the basis for the same; for example the rule of the Taliban in the 1990s in Afghanistan was one such common concern. Besides this, India has been actively extending its support towards various renovation and extension projects. Two examples are the Ayni aerodrome, which is being renovated by the Indian Air Force, and is of utmost importance to our country, and our military base hospital in Qurghonteppa, which was officially opened in 2015 and serves not only military personnel but civilians as well. What is being done to promote people-to-people connect between both the countries? You see, Bollywood is very popular in Tajikistan, especially amongst the ladies! Besides this, a number of cultural programmes are organised here in India, sometimes even at an individual level, which bring people of both cultures closer. In fact, the origin of modern Persian language finds its roots in our country. A number of famous Persian poets have found a considerable influence in India, Amir Khusrau being one of them, amongst others. Another important sector is tourism. Since the past few years, Tajikistan has been amongst the top 2-3 fastgrowing tourist destinations in the world. The country is known for its natural beauty. In fact, there is a direct flight between New Delhi and Dushanbe, once a week, which will be shortly increased to twice a week. Moreover, it is a short haul flight of only approximately 2.5 hours. Besides this, 150 yearly scholarships are provided to stdents of Tajikistan in order to study in India under ITEC Program. In addition, ICCR also provides scholarships for university degrees. In which spheres do you see scope for further economic cooperation? I think the main areas of further synergies could be agriculture and renewable energy. The former being an important sector, and India is having the required expertise of practising agriculture in different climatic zones. InTajikistan, 95 per cent of our energy requirements are taken care of by hydro-electricity. We have a total production capacity of approximately 530 billion kWh, of which only 6-7 per cent is harvested. In fact, the world's tallest dam, Norak, is 300 metres in height, with another one, Roghun, being constructed, which will be 330 metres in height. Important to note is the fact that environmental safeguard has been kept in mind while constructing these. So, I feel, a sharing of knowhow in these fields could help develop relations even further. Does Tajikistan support India's candidature for a permanent seat on the SecurityCouncil? Of course, Tajikistan supports India's candidature completely. In the eve of the 25th anniversary of diplomatic relations between Tajikistan and India I would just like to say that these 25 years of cooperation proved that we can rely on each other and both countries have a lot to share and discover with and about one another, which is why the people-to-people connect is always so important. And, this is exactly what India and Tajikistan are exploring, whether it is medical tourism, technical know-how, defence, culture or any other sector. This is, indeed, very heartening to see.